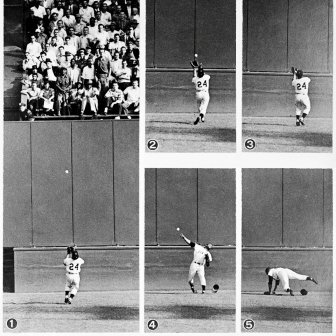 Willie Mays, the catch was a truly memorable defensive play in game 1 of the 1954 World Series, Giants Vs. the Cleveland Indians. With runners on first and second, Vic Wertz, the Indians first baseman came to the plate. The score was tied 2-2, top of the eighth inning. Wertz had worked the count to 2-1, then drove the 2-1 pitch deep to centerfield. Mays, playing shallow in center, made a running over the shoulder catch for the out, turning and making a subsequent throw, keeping the runner on second from scoring on the tag. Truly a spectacular catch in any era. Anyone who has played much outfield will tell you, the ball hit directly at you, over your head, is the most difficult play to make for an outfielder. He not only made the catch; but the throw is legendary as well. 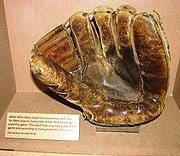 About Willie Mays and his glove, Dodger's Executive, Fresco Thompson said,"that's where triples go to die! In the summer of 1957 my family moved to Tucson, Arizona, from New York State. My father was an avid New York Giants fan, thus, so was I. My favorite player? Willie Mays. 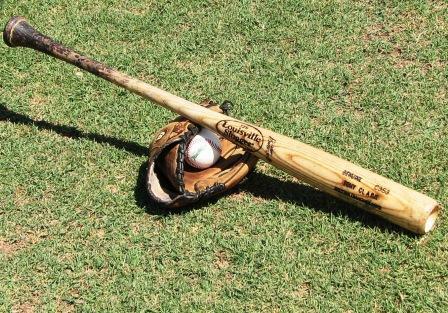 The Cleveland Indians conducted their spring training in Tucson, the Giants in Casa Grande, Az. I was at Hi Corbett Field anytime the Giants were there to play. As was my custom, even at age 11, I arrived there early to watch batting practice, get autographs and an occasional broken bat. It was the spring of 1958, four years after "The Catch". On this day, I watched intently as Mays stepped in the cage and took his pre-game BP. After leaving the cage, he went over to the dugout, picked up his glove and trotted out to centerfield. While Mays was running out to center, a Giants coach, fungo in hand, went out behind the pitcher's mound, where they had a screen set up. The coach began hitting Mays fly balls, high and deep, over his head. As he had done in the 54 series, he turned and ran, catching the ball just as he had the drive off of Vic Wertz' bat, 4 years previous. Each catch finished off with the same type of throw, all one hopping the bag at second base. The coach must have hit him at least 20-25 balls, this on a day when he would still be playing a game. At the time, and the age (11), I was amazed by the ease with which he did everything. It wasn't until I started coaching that I realized exactly what I had witnessed that day in Hi Corbett Field. 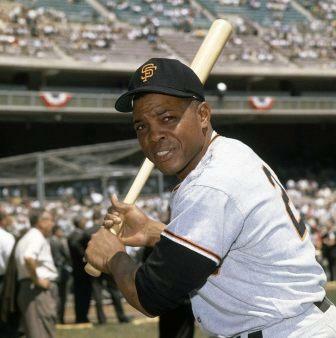 While Willie Mays was truly gifted, he worked hard to refine his game and be able to make plays such as "The Catch". It wasn't just because he was good. It was that, "Luck is when preparation meets opportunity", thing.